Design. Create. Install. We create bespoke joinery and furniture pieces, complete kitchens and cabinetry – basically anything you can think of, we can produce. Our real passion is to create conversation pieces and we especially love working with recycled materials, because they always add to the story. We often like to incorporate other materials too, like metal and plastic to add uniqueness to the project. We are a locally owned and operated family business. 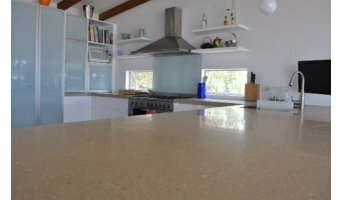 We aim to provide clients with functional, affordable and quality kitchen and joinery design renovations. Our Qualities : Since starting out in business our clients have been praising our work and thanking us for the personal service we have given them. Our clients have always appreciated that we have worked within their budget and time frames, kept them informed and up to date throughout the whole process and provided quality workmanship Our Approach : Our experience of over a decade in kitchen and joinery design renovations gives our clients assurance that we are professional and knowledgeable and will always offer sound advice for the latest designs. We understand that selecting a new kitchen involves an intensive decision-making process, and we enjoy being part of this journey with our clients. If you're thinking of embarking on kitchen or joinery renovations call us now for an obligation free measure and quote. We do everything from kitchens, laundries, bathrooms, home offices to custom designed joinery. We would love to come and meet with you and hear all the exciting ideas you have for the changes to your home. Together we will make it a reality. We go the extra mile to ensure that your renovation is as simple as possible for you. Bathroom and kitchen renovators. At Nu-Look Renovations we specialise in kitchen and bathroom renovations. We go the extra mile to ensure that your renovation is as simple as possible for you, from initial consultation to delivery. We provide expert advice to make the most of your home and investment property. First established in 2005, Matt May first saw a gap in the market for high quality, value for money renovations. He also had the foresight to see a need for complete project management to assist home owners and investors through their renovations and has continued to build and grow Nu-Look Renovations in Canberra. Matt and his team have a wide range of skills and a broad understanding of building and renovations as a whole. 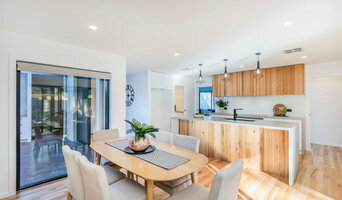 Nu-Look Renovations has a unique knowledge of construction techniques in Canberra houses which means we are able to provide innovative solutions to make your renovation dreams a reality without compromising the high standards our customers have come to expect. We pride ourselves on the art of good, old fashioned customer service and every single member of our team is dedicated to achieving this goal. We are a locally owned business specialising in the design, manufacture and installation of kitchens, wardrobes, linen & laundry cupboards, bathroom vanities, home office fit-outs, built in bookcases, entertainment & wall units. VSL Joinery Pty Ltd was established in 1986 and has been trading under new management since 2001. If you need storage space, our experienced salespeople will be able to help you find a design to suit your individual needs. Our products are suitable for both domestic and commercial applications. Please contact us via telephone or email to organise a free quote. Alfreso Australia offers a range of high quality, affordable outdoor kitchens with top quality features that are built to last. Choose from one of our unique ready-made modular designs to save time and money, or we can custom build a package to suit exactly what you need. Featuring durable Allunox full aluminium cabinets, your Alfresco Australia outdoor kitchen won’t warp or rust, and is weatherproofed to withstand our harsh Australian climate. Our products are for sale in Sydney, Melbourne, Brisbane & throughout Australia. Combine your love of entertaining and the outdoors by transforming your outdoor area, while adding value to your home and your lifestyle. Salt Renovations delivers high quality, customised projects that improve functionality and add value to your home. Whether you're looking to transform your home or just renovate your kitchen, bathroom or laundry, we can give you the space solution you have been dreaming about. Our complete project management service ensures that you can actually enjoy the renovation process and have confidence that your new space will be beautiful, functional and able to meet your expectations. If you live in or around Canberra and Queanbeyan and would like to find out how we can work with you to bring your renovation from concept to reality, give us a call today on 0450 785 235 to book your free initial consultation. Put your next project in the hands of a business that cares about your needs and lifestyle. M & M Kitchens & Joinery has been serving Canberra, Queanbeyan and the surrounding district since 1989 Starting from simple beginnings, we've evolved into a thriving business capable of completing both Commercial and Domestic projects. Our assignments have ranged from the Canberra Region Cancer Centre, Thrifty Car Rental, Canberra Girls Grammar, Kentucky Fried Chicken franchises in NSW and Victoria, the Jewish childcare centre and other childcare centres in and around Canberra, head quarters for the Australian Tax Office and various other Government Departments, several local builders and the domestic renovation market. The Kitchen Company is Canberra’s own custom kitchen and laundry renovation specialist. We are locally owned and operated and offer Canberra, Queanbeyan and surrounding regions exceptional quality kitchens and laundries to suit any size and budget. Simplicity Kitchens has been established since January 2001 and 14 years on have proven to be an innovative leader in the kitchen industry. We take great pride in producing some of Canberra's finest joinery, and this has been demonstrated by winning multiple awrds in both the Housing Industry Association and the Master Builders Association whilst our apprentices have won a variety of awards whilst training at the Canberra Institute of Technology. Since 2005 we have won more awards than any other Joinery in the Canberra region. Simplicity Kitchens is a family operated business offering unbeatable customer service, award winning joinery solutions, and a dedicated team focused on delivering the result that you as a client expect. Simplicity Kitchens offer full trade management using only qualified trades whilst all our Joinery is installed by in house staff ensuring an outstanding result every time. We are constantly sourcing the latest in products and materials combining them with an up to date manufacturing facility giving you the client the confidence in knowing that we will deliver the quality product that you are looking for. We offer a comprehensive Showroom displaying a wide variety of products and styles to help you in achieving that individual result that you are sure to be pleased with for years to come. I am able to create all types of virtual design for kitchens, bathrooms, living spaces including outdoor rooms and landscaping, no matter where in the world you live. Seeing it in 3D helps to see a clear picture of the project at hand. All I need is your plan dimensions and design preferences. Curve Joinery Canberra provides an extensive selection of modern kitchen designs to choose from, or our specialist designer can help you bring your own unique creation to reality. All our work is completed with quality craftsmanship and efficient installation by experienced tradespeople. Our high building and kitchen design standards ensure that your new kitchen renovation will last for many wonderful years. 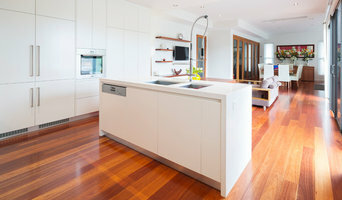 Curve Joinery Australia can provide expert advice for your kitchen renovation. We can help with choosing your new kitchen design right through to delivery and installation. Our expert staff are dedicated to making your vision happen with unique kitchen models and high quality craftsmanship, backed by an experienced team that you can rely on. Whether it is a high quality kitchen, a shop fit-out or a complex custom project, Affinity Kitchens and Joinery have the experience, skills and personalised service to deliver to your needs. A kitchen is the heart of the home, where friends and families gather to share stories and socialise. At Affinity Kitchens, we specialise in complete kitchen makeovers, working closely with builders and architects to reconfigure a floor plan layout to maximise the space or utilise existing space. Interloc is a new and exciting modular range of cabinets, designed for the budget-minded consumer, and is ideally suited for D.I.Y, renovators or builders. These cabinets are fully assembled in the factory, ready for installation. PAC Carpentry & Joinery take pride in designing and building kitchens, bathrooms and wardrobes to suit your needs and budget. Customer satisfaction is a top priority and we understand the importance of treating each customer and project as unique. Der Küchenplaner erstellt Ihnen ein individuelles Konzept für Ihre Küche in Canberra, ACT, AU. Dabei berücksichtigt der Küchenplaner für die Küchenplanung den Grundriss der Küche, die Anschlüsse, die Formen für Spüle und Schränke und berät Sie ebenfalls bei der Auswahl der Küchengeräte. Eine kompetente Beratung ist nämlich das A und O, wenn Sie Ihre neue Küche oder eine Küchenmodernisierung planen. Ob freistehender Küchenblock oder funktionale Küchenzeile – die Traumküche sieht für jeden anders aus. Um die eigenen Wünsche und individuellen Bedürfnisse bei der Küchenplanung zu verwirklichen, können Sie sich in einem Küchenstudio oder bei einer Küchenausstellung in Canberra, ACT, AU beraten lassen. Hier finden Sie Infos zu Formen und Materialien sowie Farbe und Design der Einbauküche. 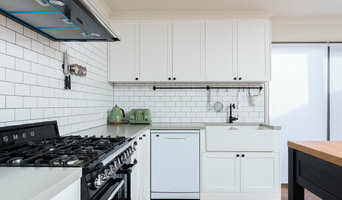 Durchstöbern Sie die Liste und entdecken Sie die besten Adressen für Küchen in Canberra, ACT, AU, darunter erfahrene Küchenbauer, Küchenstudios und Showrooms renommierter Küchenhersteller. Das Tätigkeitsspektrum von Küchenplanern reicht von der Grundrissplanung für neue Küchen bis zur Modernisierung samt Austausch der Küchenmöbel oder Elektrogeräte. Zu den Küchengeräten zählen zum Beispiel Ofen, Kühlschränke und Dunstabzugshauben. Ob Küchensanierung oder der Neubau einer Traumküche: die zentrale Aufgabe lautet, Küchenplanung, die auf Ihre Wohn- und Lebenssituation abgestimmt ist und im Alltag höchsten Komfort bietet. Dafür erkundigt sich der Fachberater nach Ihren Gewohnheiten und Alltagsabläufen. Eine Einbauküche planen zu lassen, ermöglicht es Form und Ausstattung individuell zusammenzustellen. Vielleicht ist ihre Küche in die Jahre gekommen oder Sie haben eine Eigentumswohnung erworben und nun soll die alte Küchenzeile ausgebaut und durch eine neue ersetzen werden. Küchenplaner planen und entwerfen Traumküchen, bauen Küchenschränke, Küchenregale und Arbeitsplatten nach Maß. Für das Design arbeiten Küchenstudios mit Innenarchitekten zusammen, die Montage oder den Anschluss der Elektrogeräte erledigen Schreiner und Elektriker. Mit der Betreuung durch einen Küchenplaner haben Sie auch nach dem Kücheneinbau in Canberra, ACT, AU einen persönlichen Ansprechpartner. Neue Traumküche in Canberra, ACT, AU planen – wie gehe ich vor? Wie finde ich das passende Küchenstudio in Canberra, ACT, AU? Um Küchen professionell planen zu lassen, sind Küchenstudios in Canberra, ACT, AU der erste Anlaufpunkt. In einer Küchenausstellung können Sie Musterküchen ansehen, neue Trends im Küchendesign entdecken und mit einem Fachberater über Ihre Wünsche sprechen. Viele Kücheneinrichter bieten eine Checkliste zur Küchenplanung an. Schwebt Ihnen ein bestimmter Küchenhersteller oder ein bestimmter Stil vor? Recherchieren Sie vorab, welche Marken Ihr Küchenhändler im Programm hat. 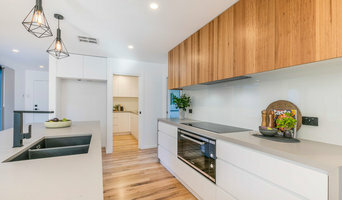 Bekannte Hersteller wie Bulthaup, Leicht, oder poggenpohl unterhalten exklusive Küchenstudios, um ihre Designer-Küchen in Canberra, ACT, AU zu präsentieren. In den seltensten Fällen wird man beim Planen von Küchen keine Kompromisse machen. Für die weitere Planung ist es entscheidend, wie teuer der Neubau oder Küchenumbau in Canberra, ACT, AU werden darf. Je konkreter das Budget, desto einfacher findet der Küchenberater die richtige Lösung für Sie. Was kostet es, eine Küche in Canberra, ACT, AU planen zu lassen? Die Kosten für individuell geplante Küchen bemessen sich nach der Größe, dem Anbieter, der Ausstattung und dem Aufwand bei der Küchenplanung. Unabhängig von der Ausführung, fallen Einbaugeräte, Schränke und die Küchenarbeitsplatte am meisten ins Gewicht. Ferner macht es einen Unterschied, ob die Küche als Unikat gefertigt oder aus einem Programm zusammengestellt ist. Auch die Wahl des Küchenherstellers ist entscheidend – Markenküchen von Leicht, Nolte, Nobilia, Alno, Bulthaupt, poggenpohl oder Häcker haben ihre Qualität – und ihren Preis. Sonderwünsche hinsichtlich der Materialien fallen ebenso ins Gewicht wie der Bau einer barrierefreien oder behindertengerechten Küche. Um Kosten zu sparen, können Sie den Küchenaufbau selber übernehmen oder auf teure Geräte wie eine Dunstabzugshaube oder den Induktionsherd zu verzichten. Die Planung kleiner Küchen ist weniger aufwändig als Küchen in L-Form oder U-Form. Noch mehr kostet eine offene Küche mit Insel und individuell geplantem Grundriss. Unser Tipp: Holen Sie auf Houzz Angebote verschiedener Küchenstudios in Canberra, ACT, AU ein. Lassen Sie sich bei der Küchenplanung die Preise für Bestandteile und die Einbaugeräte einzeln aufführen – und nicht nur den Gesamtpreis. Wenn Ihnen die neue Küche zu teuer erscheint, können Sie immer noch Ihre alte Küche renovieren lassen. Nicht immer muss eine komplett neue Küchenzeile mit Geräten angeschafft werden. Überlegen Sie zuerst, was Sie im Zuge der Küchenrenovierung in Canberra, ACT, AU verändern möchten. Sind Teile der Kücheneinrichtung veraltet oder die Arbeitsplatte beschädigt? Möchten Sie alte Elektrogeräte oder auch Küchenschränke austauschen oder möchten Sie die Küchenfronten neu gestalten?? Beliebte Ideen beim Renovieren einer Küche sind neue Fronten oder das Erneuern der Fliesen. Dadurch wird aus einer Landhausküche im Nu eine moderne Küche. Vergessen Sie beim Austauschen, Bekleben oder Lackieren der Küchenfronten nicht die übrigen Türen. Ebenso lassen sich mit geringem Aufwand hässliche Fliesen überkleben oder streichen. Auch eine frische Farbe an der Wand wirkt Wunder, um die alte Küche neu zu gestalten. Übernehmen Sie Lieferung und Küchenmontage in Canberra, ACT, AU? Auf Houzz finden Sie Küchenhändler, Küchenhersteller und Küchenmöbelgeschäfte in Canberra, ACT, AU samt Adresse und vielen Informationen. Gehen Sie die Einträge im Verzeichnis durch – die lokale Suche, Angaben zu Dienstleistungen und Beispiele von realisierten Küchen helfen Ihnen, den passenden Anbieter zu finden. Lesen Sie die Bewertungen, um zu erfahren, welche Erfahrungen andere Kunden gemacht haben. Kontaktieren Sie dann Ihren Küchenplaner, um mehr Infos zu Ihrer Wunschküche in Canberra, ACT, AU zu erhalten.